Since he was a little boy, Danny Treanor dreamed of becoming the world’s first 12-year-old disk jockey. He practiced nightly and picked a DJ name. Despite his hard work, radio stations were reluctant to hire 12-year-old Danny. Not letting their obvious misunderstanding of his talents deter him, Danny persevered, landing his first radio job at the mature age of 16. Moving to Alabama for college, Danny found opportunity at WALA-TV. From booth announcing, hosting Dialing for Dollars, narrating and producing parade coverage, to filling in for technical directors and even weather forecasters. Weather forecasting, now there was a cool job! Though the only forecast tool in 1966 was a wire service and calls to the local weather service office, Danny became a friendly face with a forecast and made WALA home for 11 years. Real opportunity came in 1978. An offer to weather forecast full time for WFTV in Orlando! He was ready for a cushy job like that. How hard could it be? They told him Central Florida has the same weather every day for 9 months. In one year, Danny helped WFTV go from #3 to #1 taking the area by storm — pun intended! Over 18 years, Danny became a household name. In 2003 Danny joined Bright House Cable News 13. After 10 years of Weather on the Ones, he retired. Or so he thought! 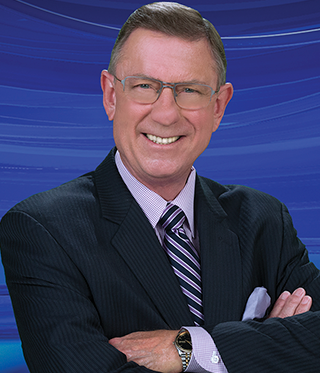 Yep, he’s come out of retirement for WKMG News 6 and the family he hopes to grow old with.